Setting up a car rental in Pattaya Thailand is simple. Arm yourself with this knowledge and you'll have the freedom to travel Thailand. Also enjoy the safety of the car's 4 bumpers protecting you. Rest easy about the road - it's well developed and there are directions everywhere. 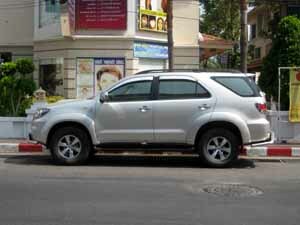 In Pattaya you can find car rentals just about anywhere between beach road and 3rd road. Private car rental places in Pattaya are a little cheaper than the larger outfits. However, you may want to consider renting from a larger company which will provide proper rental insurance. Some people rent cars at the Bangkok airport. You can also make a reservation online with Orbitz without paying in advance. If you are coming to Thailand for the first time I would not suggest to drive on your own. Most rental places will require you to pay upfront plus sometimes a deposit of several thousand Baht. When renting a car walk around the car and make sure to take pictures of any existing damage or ask for an undamaged vehicle. I always make sure that I receive a car with a full tank as it is much easier to return the car with a full tank than trying to match a fuel level. A foreigner driving in Thailand is required to either have an International Driver's License (IDL) or else get a Thai driver's license to drive. Many policemen will be satisfied if you produce a Driver's license from your home country when you are being stopped but I am not sure how that may play out in case of an accident. Don't go on price only and make sure the car has proper commercial/Rental insurance and ask to see a copy of the policy. If the vehicle is not properly insured, in case of an accident the driver is kept liable for all claims. Put a copy of the insurance policy in the car, along with a copy of the car registration book and make sure you also have the telephone number of the insurance company. Thailand has an excellent network of well maintained roads and highways between all main centers. Almost all of the north south routes are dual carriage way. Road signage follows international convention and is in both Thai and English. Unless you know where you are going I wouldn't recommend night driving. Motor bikes can on occasion be a hazard...particularly as they are often ridden into oncoming traffic! In any case watch out for these kinds of accidents when driving in Pattaya. All insurance is invalid if a driver exceeds the legal alcohol limit. In any case have a good time driving around Pattaya and stay safe to avoid these serious accidents!